Are you targeting your own country? Is your HTML up to the meta standard? An invaluable resource from Google, that indicates how well your website is performing. More importantly, it will tell you if Google has issues with your website! You will need to add each website you wish to monitor. Click the Add a Site link and type in the URL for your website. Each time you add a site, you will be prompted to verify that you are a webmaster for that website. Follow the instructions and verify your status. I personally prefer to use the Upload HTML file method. The file you receive can be re-used on all your websites for verification, and uploaded quickly. Search engines designate a website to a country. This means that website will perform better in that country, than in other places around the world. If you have a .com domain and it is hosted in another country, then the odds are Google and the other search engines have incorrectly chosen your country. You may be in Australia but targeting the USA! With the Google Search Console you can fix this. From your websites dashboard, go to Site configuration->Settings. The first option allows you to designate your country. 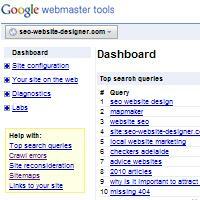 The Dashboard shows a summary of any issues Google has with crawling your website. The Diagnostics section provides more details. You should address and fix all issues. The Google Search Console has a section which makes suggestions to improve the meta data of your pages. This is the data that Google often uses in its search result headings and summaries, so its quality is important to you and Google. My articles on Page Titles and Page Descriptions provide more details on the importance of this information, and how to correct it. From your websites dashboard, go to Diagnostics->HTML suggestions. Address any suggestions shown. I like my URLs short and sweet. To get this, you can tell Google to never include the www. in its displayed URLs. From your websites dashboard, go to Site configuration->Settings. The second option lets you designate how Google displays your URLs. To make things work even smoother, you should have all the website variants 301 redirect to your chosen one. e.g. if you are secure and do not use www, then all other variants should redirect to the https://domain.com one. From then on, foucus on the reports for the variant you have chosen. If your website generates a SiteMap.xml or an RSS feed, then you should register them. This helps Google index your website. Blogging systems often generate an RSS feed. From your websites dashboard, go to Site configuration->Sitemaps. Then submit the URL of your Sitemap or RSS feed. At times you may find that Google has indexed a page that no longer exists. The best solution is to 301 redirect that page, to a valid one. However, if that is not a viable option, you can request Google to remove it. From your websites dashboard, go to Site configuration->Crawler Access. One of the tabs is a Remove URL link.